The National Commission on Fiscal Responsibility and Reform for reducing the deficit in the US came out with a preliminary report that has sent shivers down the spines of public broadcasters. The co-chairs of the study, Erskine Bowles (President Clinton's former chief of staff) and former Senator Alan Simpson (Republican of Wyoming) called for a gradual phasing out of federal funding for the Corporation for Public Broadcasting. CPB, a private corporation funded by Congress now receives around $500 million a year. About two thirds of that goes to fund PBS and the public broadcasting television system. The rest goes mostly to public radio stations. NPR receives almost 2% of its operating budget from CPB, but it indirectly receives more from member stations dues and fees. The radio stations rely on CPB for an average of 13% of their funding. The TV stations, even more. This attempt to "zero-out" public broadcasting has been tried before. In 1994, the Republican takeover of Congress began with Speaker Newt Gingrich calling for the same abolition of publicly funded public broadcasting. It failed spectacularly, mostly because of strong grass roots opposition and because in 1994, the open ideological opposition to PBS and NPR was not enough to garner popular support. What's different this time is that there is more political support for the Republicans (although this may prove to be a short-lived as the exuberance for Barack Obama was in 2008). And there appear to be compelling economic reasons this time as well. The financial situation in 2010 is considerably more serious than it was in 1994 when the Clinton administration ran a surplus. Public broadcasting can resist the pressure if it can demonstrate its value to the American people. This means more than special pleading (although more of that done smartly won't hurt). But if public media were to demonstrate that it is providing something commercial media cannot or will not, citizens might be more willing to rally around. NPR is already doing that, but it can do more to serve the needs of the present and the next generation of under-served citizens especially in a digital environment. A few years ago, a grass-roots movement for local radio called "Low Power FM" was squelched by a combination of commercial and public radio lobbying. LPFM was said to interrupt the signals of public radio stations by broadcasting on adjacent frequencies. Congress agreed and outlawed these community stations. NPR lost a lot of credibility when it allied itself with the National Association of Broadcasters to shut down LPFM. And the people behind LPFM haven't gone away and they haven't forgotten. These grass-roots forms of community media are still out there, working in different areas, waiting for a chance to relaunch their ideas. This would be a chance for legacy public media to partner with them, to learn new techniques from them and, in turn, to set some ethical standards and skill-sets that could help these new media practitioners. It won't be easy. There is a lot of suspicion on all sides and finding what will work with the listening and viewing public will be a hit-and-miss proposition. But as Richard Sambrook, the former head of BBC News has observed, "the build it and they will come" mentality among broadcasters - public and commercial - hasn't worked. So a new approach is needed. Sambrook has written that public media needs to "stop looking in the mirror and start looking out the window." There are communities outside of public media that have achieved an astonishing level of self-sufficiency. What they lack in expertise, public media can provide. 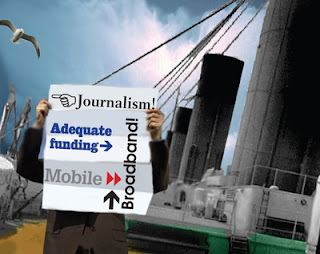 What public media lack in public support, grass roots media can provide. The threat posed by the National Commission on Fiscal Responsibility and Reform may just be the vehicle for focusing the attention of public media to achieve a more useful and long-term outcome.